From there, we spent about 20 days island-hopping around the country. Highlights included hiking through the jungle surrounding Lake Balinsasayao in a rainstorm; watching an 86-year-old bolo-bolo (or shaman) blow out whatever ailed my colleagues into a glass of water via a reed straw; snorkeling and kayaking off the coast of Siquijor; $6, hour-long massages; spotting a tarsier in a tree; beholding the Chocolate Hills of Bohol; being moved to tears in the martyred poet Jose Rizal’s museum in Manila; singing karaoke in Cebu City; and reading in the bombed-out remains of a cinema on the war-torn island of Corregidor. 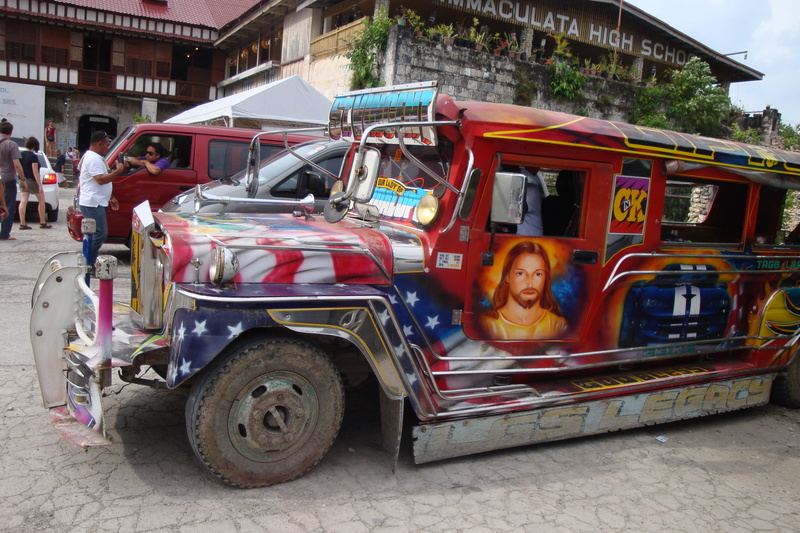 What will bring me back: the mangoes; the flores de luna (deeply perfumed “moon flowers”); the crazy colorful jeepneys; the Filipino tendency to double their words (e.g. “balik-balik” for “come again”); the tradition of greeting guests with leis made of seashells; the fabulous nicknames (e.g. “Bing-Bing,” “Buzz,” and “Peachy”); the coconut shakes; the green mango shakes; the strangler fig trees; the calamansi juice (from the sweetest, tangiest, tiniest limes ever); the pet-sized geckos scrambling across the ceilings; the mango birds (which literally look like mangoes with wings); the jubilant names of things (e.g. the fast food restaurant Jollibee’s “Chicken Joy”); and above all — the warmth and beauty of the people. I’m so grateful to have returned again to Asia, a place I called home more than a decade ago. I need to figure out how to make it part of my life again…. Anyway! I hope y’all enjoy the photos. Salamat…. Beautiful pictures of the Philippines. I’ve heard a lot about this country, amazing places to go, the different variety of culture and the kind, generous and hospitable people that gives you a very warm welcome the moment you step on the place. I’ll surely would love to visit this country too and tried what you mentioned above.